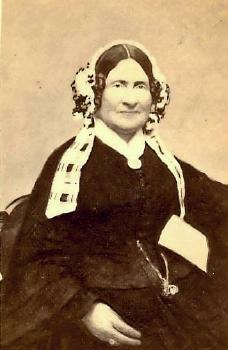 Abigail Atkins was born circa 1773.1 She was the daughter of Capt. Silas Atkins. Abigail Atkins married John Williams Quincy, son of Dr. Jacob Quincy and Elizabeth Williams, circa 7 May 1794.1 Abigail Atkins died in August 1862. [S392] Website findagrave.com (http://www.findagrave.com/) "# 6624822." [S189] Frederick A. Virkus, Abridged Compendium of American Genealogy, Vol. 5 p. 266. [S83] NEHGR, Vol. 34 p. 53. [S179] Daniel Langdon Tappan, Tappan-Toppan Genealogy, p. 80. [S130] Massachusetts Vital Records, Vital Records of Newbury, Massachusetts to the Year 1850 - church record, Third Church, now First Religious Society (Unitarian) of Newburyport. [S232] Ancestry.com, Quebec Vital and Church Records (Drouin Collection), 1621-1967. (Québec (Saint Mathew`s Church)), 1902. [S34] Unverified internet information, http://www.hkvca.ca/historical/Honours/mc/atkinson.htm (December 2008). [S205] Newspaper, The Lethbridge Herald (Lethbridge, Alberta, Canada), 7 September 1945. [S522] Gordon A. Morley and William J. Park, Mount Hermon Cemetery, U302. Rev. George Henry Atkinson was born in 1819. He was the son of William Atkinson and Anna Little. Rev. George Henry Atkinson married Nancy Bates in 1846.1 Rev. George Henry Atkinson died in 1889. [S170] Unknown author, Genealogy of the Sparhawk family, p. 15. [S180] Bible Records, NEHGS Bible Records, Gen 1 T 152: William Toppan Bible. [S522] Gordon A. Morley and William J. Park, Mount Hermon Cemetery, U303. Olive Atkinson was born in 1887 in England. She married Carl Radcliffe Slane Fleming, son of Capt. Joseph Fleming and Sophie Janet Sewell, say 1915. William Atkinson was born in 1779. He married Anna Little, daughter of Col. Josiah Little and Sarah Toppan, in 1804. William Atkinson died in 1866. [S232] Ancestry.com, Quebec Vital and Church Records (Drouin Collection), 1621-1967. Aubigny (Church of England), 1867. [S205] Newspaper, The Morning Post (London, England), Saturday, January 31, 1859. [S100] 1871 British, St Mary Magdalene, Launceston, Cornwall. [S25] Samuel Sewall, Diary of Samuel Sewall (1973 ed. ), Vol. 2. p. 1094. [S102] Annie Haven Thwing, Inhabitants of the Town of Boston, 3225. [S282] Francis Atwater, Atwater, p. 426. [S99] Robert Charles Anderson, The Great Migration begins, Dummer. [S282] Francis Atwater, Atwater, p. 37. [S282] Francis Atwater, Atwater, p. 35. [S282] Francis Atwater, Atwater, p. 36. [S83] NEHGR, Vol. 61 p. 48. [S21] Various editors, Dictionary of National Biography, Gruffudd ap Madog. [S205] Newspaper, The Sydney Morning Herald, 25 July 1910. [S205] Newspaper, The Sydney Morning Herald, 9 November 1928. [S205] Newspaper, Truth, 20 May 1928.